We have our last practical today! At points I think to myself I love this so much and then there're moments in time I think when will this be over. We made a duck with orange sauce today. 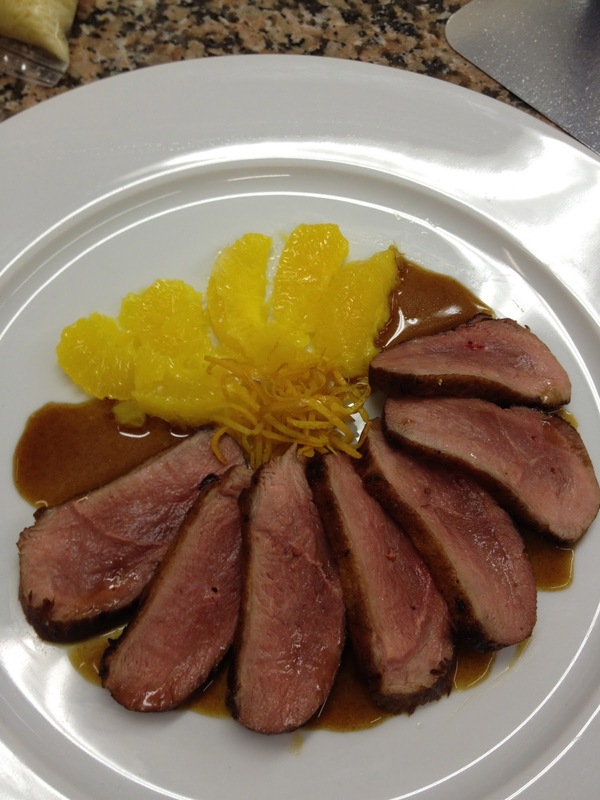 The sauce is sweet-and-sour, and was delicious with the duck. The orange peels almost tasted candied. The breast, huge. I tried to make the skin crispy because chef likes it that way. So do I.
Afterwords we went to classmates apartment to go over the dishes for the practical exam. We ordered Dominoes pizza. It was still very French. We ordered the three cheese pizza which included camembert, goat, and blue cheese. Combinations I've not ever had on pizza. My international friends included one from Russia, one from Lebanon, one from Chili, one from Canada, one from Greece, and yours truly U.S. Minimal requirement to be there, two languages. Just kidding, had I known just English, they still would have included me. I found out I passed my written exam today! Now off to study the practical exam!